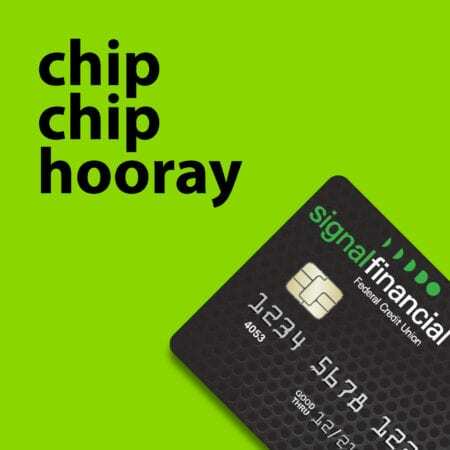 Home > News Articles > Chip debit cards are coming to Signal! Chip debit cards are coming to Signal! Stay tuned for more information about our new chip debit cards over the next few months. At Signal, we take your financial security very seriously. With card fraud, identity theft, and hacking at an all-time high, it is critical to have state-of-the-art technology to guard your personal information. Fortunately, that is exactly what chip card technology is designed to do. Magnetic stripe cards can be easily “skimmed”, putting your financial information at risk, but EMV chip technology adds extra layers of security to your card through a more thorough authentication process, thereby making it much more difficult for your card information to be stolen. Card authentication. The card is authenticated during the payment transaction,which prevents the use of a counterfeit card. Chip transactions also create unique transaction data, so that any captured data cannot be used to execute new transactions. Cardholder verification, authenticating the cardholder and protecting against lost and stolen cards. Cardholder verification ensures that the person attempting to make the transaction is the person to whom the card belongs. Transaction authorization, using issuer-defined rules to authorize transactions. How this is done can get a little technical, but it boils down to the card issuer allowing the transaction to go forward after everything else is verified. Most retailers accept chip cards today and it is quickly becoming the global standard with experts predicting a 100% shift to the technology in the USA by the end of 2017. While chip cards assure vastly greater protection from fraud than traditional magnetic stripe cards, they are not a complete solution to card fraud. It’s just as important as ever to guard your personal information and be careful with how you use your debit cards. When using your debit card, always opt to use it as a chip card instead of swiping the magnetic stripe, and use your PIN to verify your identity whenever possible. If you don’t actually use the chip or the PIN, they can’t protect you. Unfortunately, EMV chips do not improve the security of online transactions. While POS terminal losses certainly will be reduced, cyber criminals are likely to shift their strategy to increasing fraudulent online transactions. When making online purchases, be careful that the website you’re using is a legitimate business, that the web address starts with “https://”, and don’t ever give out your card information by typing it into a pop-up window or via email. If you make frequent purchases online, read up on how to reduce your exposure to hacking, malware, and other types of online fraud and theft. The best defense is to use a credit card. Finally, no security technology is impervious to compromise. With the potential rewards for fraudulent card transactions so high, the ingenuity of cyber criminals will know no bounds in attempts to break into the chip card use of the world’s top economy. The vigilance of financial institutions like Signal and the adoption of EMV chips can help prevent fraud, but cardholders must also stay watchful. Using purchase alerts and checking your balances frequently is a good way to catch fraud quickly and stop it before it gets really costly. Chip card implementation has enormous potential to reduce losses at POS terminals and protect consumers from fraudulent transactions. Please see our blog post for more details about EMV chip technology. As always, we are happy to answer your questions. We can be reached via secure message in online banking, at memberservice@signalfinancialfcu.org.